With the election of Pope Benedict XVI, the world witnessed the pomp and honor of the Swiss Guard, the "Pope’s Army." 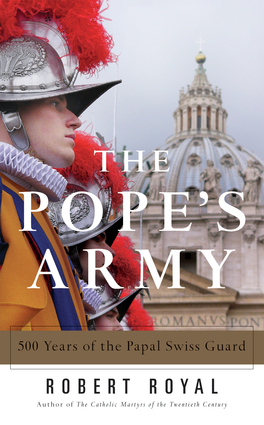 Now best-selling author and Crisis columnist Robert Royal takes us through the colorful 500-year history of the military guard that has witnessed every major Vatican event for half a millennium. Topics include: origins; five hundred years of fortitude; the Medici Popes; the sack of Rome; siege, dissolution, rebirth and the Napoleonic war; the unification of Italy; the Pope’s imprisonment; two World Wars; the Nazi occupation of Rome.